The Urban Politico: Guest Post: Will the South Ever Catch a Break? Today's guest post comes from a fellow blogger by the name of The Storyteller. She originally hails from Chicago and is currently a news producer at an NBC/ABC affiliate in the sunshine state of Florida. So please engage our guest in the comments as we discuss the natural disaster in Alabama and the South. Yesterday marked one week since the worst tornadoes in 40 years swept through the South leaving trails of destruction, hundreds of people dead, hundreds more injured, and some already struggling communities more desperate and destitute than they were before. 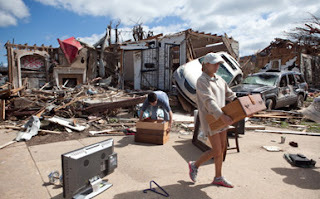 The killer tornadoes continue a long line of natural and manmade disasters that have devastated the South in recent years and have left entire states and industries broken, ravaged, and destroyed. Last year the entire state of Tennessee was under water from heavy downpours and severe flooding. Further South, oil lapped up on beaches from Louisiana to Florida with a few spotted sightings in Texas. Hurricane Ike pummeled Houston and Galveston and the carnage from Katrina remains six years after the storm has come and gone. We airdrop food and water in Thailand, Chile, Haiti, and Japan, we offer millions of dollars in assistance to disaster zones around the world, we help rebuild nations in countries with which we are warring but all our Southern states receive is empty promises of help and aid from the same agencies that were found to be more hindrance than help in previous disasters. While our government takes a “We Are the World” approach to every other country across the globe it forgets citizens right here in some of its own states. We told Haiti they will not be forsaken, they will not be forgotten, we said the same thing in Tuscaloosa, Alabama, and while American aid is on the ground in Port-au-Prince, residents in Tuscaloosa are waiting for FEMA and HUD’s new emergency response system to take affect. Is it just me or does this seem backwards? It would seem to me our government would want to strengthen its own communities before it strengthened communities in other countries with their own system of government. It would seem to me our government would want to make sure neighborhoods hard hit by disasters were protected and safe the same way we make it our mission to protect and save civilians in war zones. Tuscaloosa, Alabama, with its mile wide and miles long wreckage and rubble, looks just as bad as images of any other war zone I’ve ever seen. Post-Katrina New Orleans looked worse than last year’s flood plagued Pakistan. But this is not about which disaster is worse, this is about doing what’s right. It makes no sense to build and re-build countries, even ones we have special interests in or are allied with, if we can’t keep sections of our own country together. It makes no sense to offer aid to other countries when we’re cutting budgets for programs we need here at home. Maybe I sound selfish but I thought we were supposed to take care of home first and then worry about everyone else. In his speech on taking immediate action in Libya, President Obama said “our strength abroad is anchored in our strength at home.” The words sound good even if they are untrue. Our strength at home is minimal at best, we may all be singing “Kumbaya” and chanting “Thank God the terrorist is Dead” but outside of that shared jubilation partisanship remains, fringe groups remain, mistrust remains, and a splintered republic remains. The only way to repair that strength is to aid the people most in need; those still suffering under the weight of disaster be it a week or six years old. But then again with the country’s focus on strengthening the economy (which can’t be done if individual communities are not helped first) and strengthening our armed forces it seems to me we will learn the hard way of who to help first giving breaks to citizens in countries not our own while Americans wait for stingy handouts from a government sworn to protect them. Do you think the government is moving fast enough to aid the tornado ravaged South?